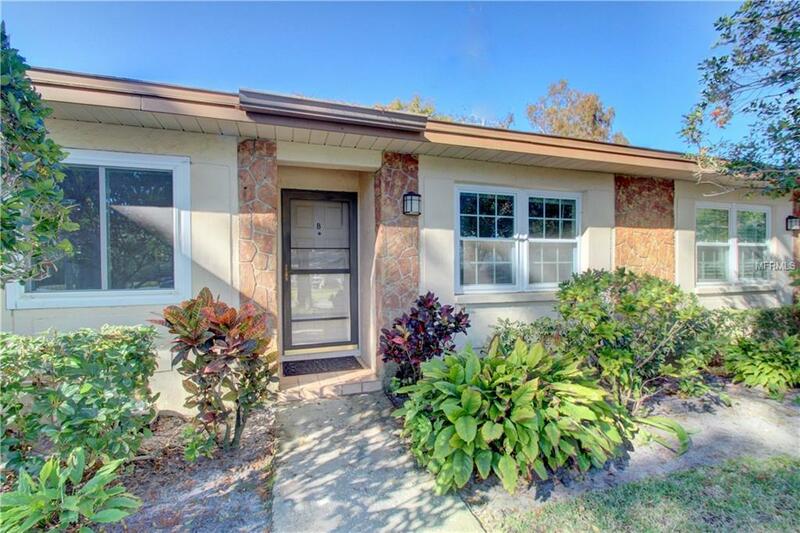 Beautifully updated maintenance-free villa home in desirable 55+ Palm Harbor golf community. Villa features include newer kitchen with wood cabinetry, granite counters & stainless steel appliances, hurricane rated thermal pane windows and sliding doors, newer flooring of bamboo with light oversize tile in the wet rooms, split bedrooms with spacious master suite outfitted with two closets & storage system, newer dual sink vanity, & step-in shower, an inside laundry room with utility sink, updated guest bathroom, and a Florida room looking out to a nice green lawn space. Generous closet space in the villa and and an oversize single car garage provide additional storage. Almost unbelievable maintenance fee of $316/month includes all exterior maintenance including the roof, grounds, irrigation and pest control, building insurance, water, sewer, trash removal & cable tv. The community just made adding a covered patio outside the Florida room allowable too!Highland Lakes is Palm Harbor's premier 55+ golf and more community. The HOA fee of $108 a month includes free golf on 3 executive courses, heated pools, tennis and pickleball leagues, multiple fitness classes, interest clubs and card groups. The huge clubhouse is the venue for more entertainment and social events than you can fit on your calendar. Fronted on Lake Tarpon, there is also the lake lodge with pool, a private boat ramp, fishing pier, and free RV or boat storage in a secure lot. Come enjoy the good life in Highland Lakes! Additional Water Information Community Pontoon Boats Lodge On Lake Tarpon Boat Ramp To Lake.